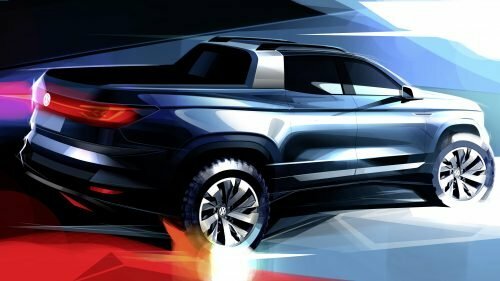 At the São Paulo International Motor Show on 6 November, Volkswagen will celebrate the world premiere of an extraordinary Pick-up concept, which fuses the features of a digitally networked SUV and the versatility of a consistently well-thought-out Pick-up to form a new, urban-oriented vehicle. One of the especially noteworthy innovations of this concept is the multivariable loading area: in just a couple of simple steps it can be significantly extended thanks to the folding rear panel of the double cab. The concept car is positioned below the Amarok, but is based on the modular transverse matrix (MQB), just like the successful Tiguan compact SUV. The world premiere of this all-wheel drive concept vehicle also starts the countdown to the launch of the series version; the model is due to launch on the Brazilian market in the foreseeable future with just a few minor tweaks. This new Pick-up’s potential is so great, however, that the vehicle concept could conceivably be suitable for other regions.